Photokina September 2018. The Leica Camera AG, Panasonic and Sigma announced a strategic partnership. The “L-Mount Alliance”. All customers of all three partners will benefit from it. 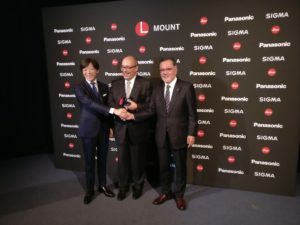 Apart from Leica, Sigma and Panasonic will offer from now on both, cameras and lenses for the L-MOUNT. This lens mount is suited for fullframe and APS-C sized sensors. The L-Mount was developed by Leica Camera under the proviso of providing customers with a future-proof, flexible, robust and precise bayonet mount that would fulfil even the most demanding photographic needs. Since its initial appearance in 2014 within the Leica T, development of the L-Mount was continued by Leica as well as by its strategic partners, which led to significant improvements and therefore an effectively new and more polished LMount technology. To ensure maximum product diversity, the diameter of 51.6 millimetres was chosen to make the L-Mount suitable for use not only with full-frame cameras, but also on cameras with APSC sensors. The short register of only 20 millimetres enables a short distance between the lens and the sensor, which in turn enables considerably more compact construction – which is particularly helpful for developments in the wide-angle lens segment. To ensure resistance to even the most extreme stresses, and to guarantee customers maximum reliability in many years in intensive use, the camera bayonets are manufactured from wear-resistant stainless steel and with four flange segments that prevent canting and ensure particularly secure and precisely positioned lens attachment. The standardised L-Mount contact strip ensures trouble-free communication between the electronic components of the lens and the camera – including the possibility of installing future firmware updates for lenses to react to technological advances and exploit the full performance potentials of the lens.